Discussion in 'Game Discussion' started by Acina, Nov 21, 2010. Selecting your race, class, and look is just the beginning of character creation in Guild Wars 2, with a series of biographical follow-up questions that determine how your personal story unfolds. ArenaNet wants to make Guild Wars 2 unlike any other massively-multiplayer online role-playing game out there, and that all starts with character creation. Borrowing a mechanic previously seen in games like Bethesda's Elder Scrolls series, once you choose a class and race, you'll be presented with a series of personal questions to help fill-out your character's biography. What school did your character study at? What is your character's social background? Is your characters friendly or intimidating? The answers to the questions, which vary depending on your class, race, and gender, will affect the way NPCs react to you as you play the game. It also affects the evolution of your home instance. 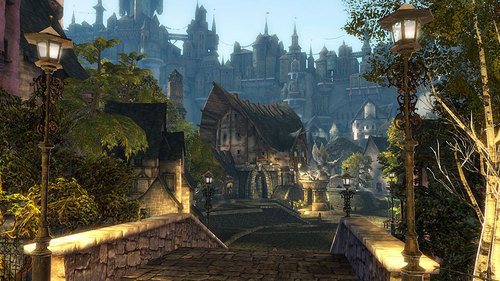 Each player is given a home instance, with different characters and resources available there. As your personal story in the game unfolds, your home instance will change to reflect the choices you make, giving the game a greater feeling of personal impact than any other MMO before it. You'll gain access to special equipment, titles, and shops, all depending on the answers to the questions you give during character creations. According to the article at the official Guild Wars 2 site, there are thousands of story combinations available. There are currently 10 biography questions with three to five answers each. With questions varying by race and class, plus additional story differences depending on which in-game order you side with (see link below), no two characters you create should experience the game the same way. Guild Wars 2 gets more exciting with each new scrap of information they feed us, doesn't it?